What should I do in the show media section? 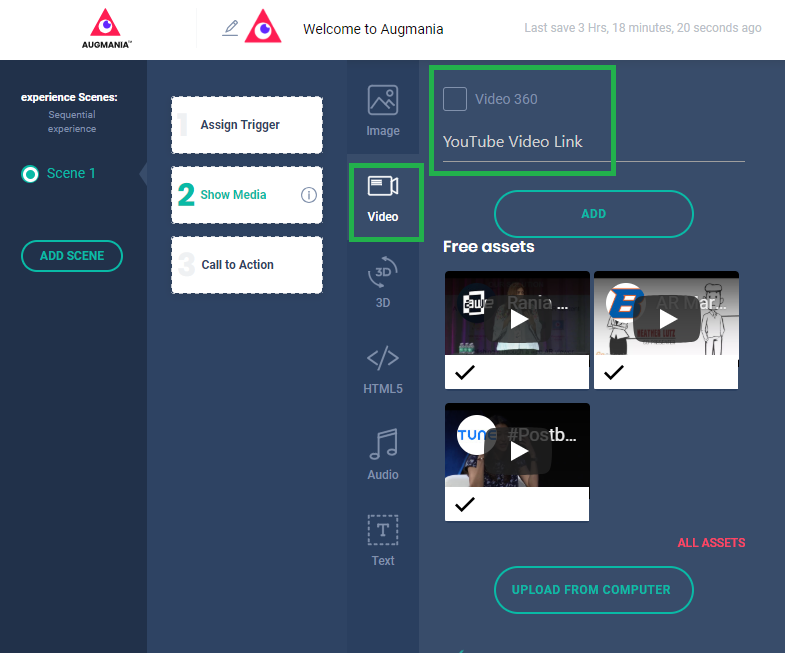 After fulfilling the first step of your experience creation by assigning a trigger (check article),you will need to upload your digital assets according to your preferences which we covered through the different features the platform is offering. 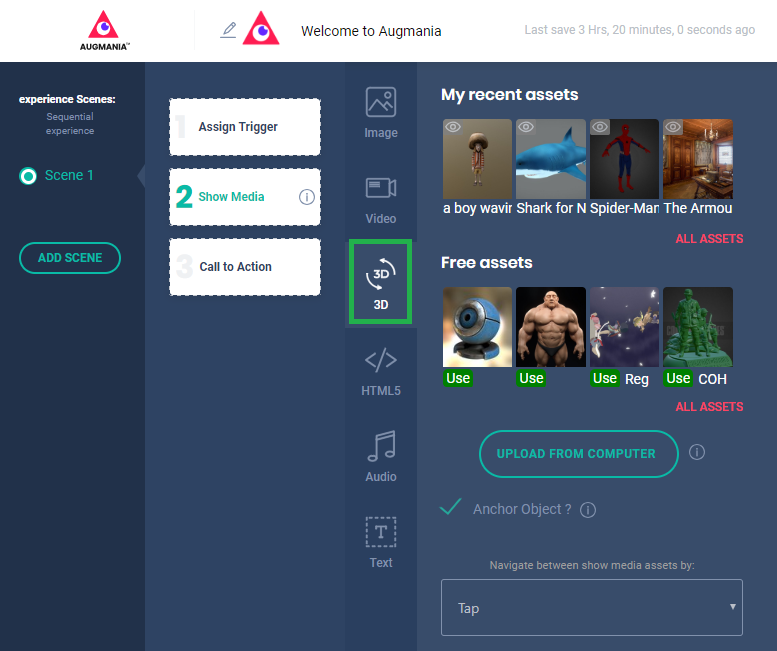 You can upload the digital assets into the experience panel directly while creating the experience itself or add it to the platform using the "Upload assets" button before even starting to creating anything. 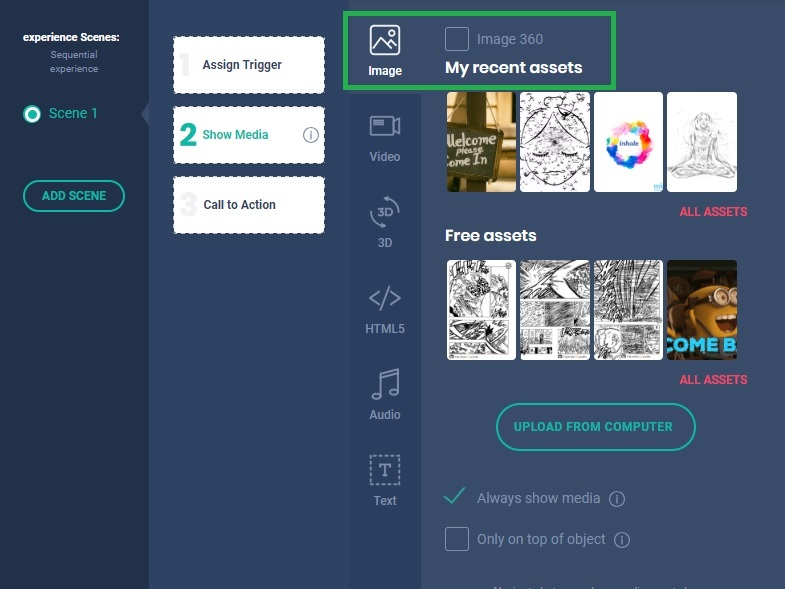 In this case, once in the panel, you will find the assets previously uploaded under "My recent assets"
Those digital assets could be static images, or if you want it to be 360, simply check the "Image 360" box..
Next, by clicking on the 3D icon, you will be able to add any 3d model or animation you wish easily without worrying about the file extension as it will be automatically converted to the most user friendly format , glTF 2, which will prevent the occurring of any issues related to the scale, texture or material of the object. You can also choose assets ones from our free library by simply clicking , on "Use". There's more when it comes to 3D objects, you have the option of making your models anchored, which means that they will always show on the phone screen of your audience even one the camera is no longer on the trigger. You can also move around it and see it from different angles. To boost engagement, make sure to add some interaction, through choosing how your audience can interact with the media displayed; This happens by choosing the kind of action you want your audience to take when seeing a specific object or animation. You might want them to tap on it or simply swipe it in different directions. So now your audience will be able to do more than just seeing the experience, but also engaging with it. To make the experience more enjoyable, we recommend adding a cool audio sound playing in the background of the scenes or some interactive game. Make sure to include some text to explain how it works! 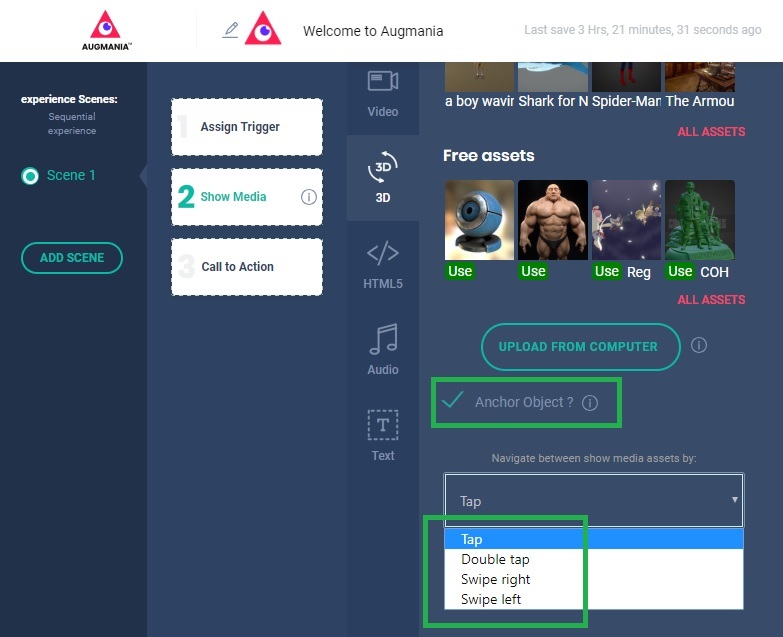 Once the experience is published, your audience will be able to see all the media you added displayed on their phone screen right after scanning the trigger.